The Apilux SmartPro intense pulsed light device combines technology, power, intelligence and mobility in a compact efficient system. Whether for photoepilation, acne treatments, or the reduction of pigmentary and vascular lesions, the Apilux SmartPro offers your clientele a wide range of high-performing and safe IPL treatments. The 2nd generation of the Apilux SmartPro IPL device is sure to impress you. Straightforward and providing enhanced performance, this unit of pulsed light will allow you to maximize your treatment results and revenues while keeping your maintenance expenses to a minimum. The Apilux SmartPro offers up to 12 high-grade optical quartz filters which can be used for a variety of treatments, including photoepilation, photorejuvenation, acne, pigmented lesions and vascular lesions reduction. Two different waveguide sizes are available: 0.35sq in. (2.25cm2) for the treatment of small areas and 1.28sq in. (8.25cm2) for quick treatments covering larger body areas. To enhance effectiveness, comfort and well-being during treatments, each flash produced by the Apilux SmartPro system is broken into a sequence of short pulses (APL). Up to 6 micro-pulses per flash are generated by the sophisticated SmartPro software to maximize warm absorption by the targeted area (the hair). 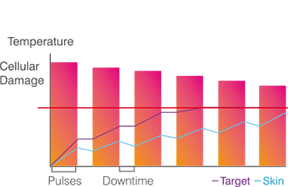 Pre-determined delays between each micro-pulse enable skin relaxation times for heat dissipation between pulses. The predefined programs are precisely adjusted according to skin phototypes and hair densities, making the Apilux SmartPro the easiest and safest device offered on the photoepilation market.